Jack in the pulpit, scientifically known as Arisaema triphyllum is a beautiful bulbous plant native to America and Canada. It has unique appearance-tall stalk with a hooded cup shaped plant on the top. This plant is commonly known by many names such as American wake robin, wild turnip, bog onion, Indian turnip, brown dragon, arum, three-leaved arum, devil's ear, swamp turnip, lords-and-ladies. It is finely grown in moist places of North America. It is known by its uniquely shaped and peculiar colored flower. In the ancient period, the Mesquaki Indian tribe were said to use Jack in the pulpit plant as a source of poison over their enemies. They had the method of mixing this plant product: root, parts of leaves etc in the meat for over a night and leaving it for over a night. The enemies do not notice the presence of this poisonous plant and thus, suffer from difficulty in breathing, skin irritation and some even face death. Flower : Jack in the pulpit gives rise to unisexual flowers colored in green, brown and purple. The flowers bloom from April to June. The smell of the plant is the reason for its successful pollination. Leaves : The plant is rich with three lope-shaped leaves. It has large green leaves. 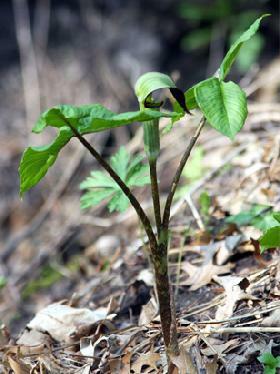 Jack in the pulpit has trifoliate leaves. The leaf is 8-15cm long and it is as broad as 3-7cm. The color of the leaves is greenish-yellow. Some leaves are green with purple brownish stripes. These leaves fall off during the summer months giving way for the flowers to bloom with brightly colored red berries. Seed : Jack in the pulpit produces red colored seeds. Each fruit contains a number of seeds. Jack in the pulpit roots can be consumed as a food. You need to roast the bulbs well for approximately for an hour. Growing : It is not a difficult job growing jack in the pulpit yet, you need to keep some suggestions in mind. You need to plant the bulb about 6 inches deep into the soil. This plant prefers growing in a moist soil that is rich in organic substances. It requires well drained soil and needs a shady environment to thrive . Since this plant requires a great amount of soil to thrive well, you are suggested to provide extra amount of compost manure before the plantation and even after you start the plantation process. One interesting fact about this plant is that, this plant is not bothered by insects other than slugs. Uses : Upon consuming this plant by cooking well, this plant serves as a good food product. It has some effective medicinal purposes too, for example in curing rheumatism, snake bites, bronchitis etc. Caution : Jack in the pulpit contains calcium oxalate crystals, upon consuming this substance burning sensation along with skin irritation is felt in the mouth as well as in the digestive system. There are cases where the consumption is in excess leading to throat and mouth swell, this effect causes difficulty in breathing. Habitat : Jack in the pulpit is a perennial plant commonly found in the North American regions from the Nova Scotia to the Gulf of Maxico, Minnesota and Louisiana. It is found in good number in the western, northern and southern regions. It grows in the deciduous forests that is rich in moist soil. The soil needs to be rich in acid pH, moist, well aerated, rich in humus (dead leaves, branches, moist soil). Marsh, swamps and woodlands include their core habitat. They require partly sunny environment and with good amount of water availability. Reproduction : Jack-in-the-pulpit follows two methods of reproduction namely vegetative reproduction and sexual reproduction. In case of vegetative reproduction, small cormlets are developed from their parental corm and these cormlets within the process of time develops into a newly formed plant. Going unto the asexual reproduction process: the male pollen is transferred to the female pollen through various agents such as insects, birds etc. Seed : This plant produces red colored ripened fruit in the autumn months. Only some plants of this specie produces fruits. Ecological impact : There consists toxic elements such as oxalic acid and asparagines in the tissue of jack in the pulpit. Its effect is felt upon consumption, the berries gives a burning effect in the throat and mouth. Especially the roots are major toxic. Despite the toxic nature of this plant, the plant is often eaten by deer and attacked by fungus pathogens and insects. The berries are eaten by birds and animals. Use: Although this plant is taken to have toxic nature due to the presence of calcium oxalate, this plant showcases some medicinal values too. This plants toxins are used in the production of ointment to cure ringworms, tetterworm etc, tonics and poultices. It also helps cure headache. It is strange but the roots despite its toxic nature is dried for several months after spring to manufacture cereal, chips and bread of chocolate flavor. This plant serves as an antiseptic, a stimulant, an irritant, a diaphoretic etc. Caution : Keep in mind, this plant is edible does not mean it is not poisonous. For instance, the roots when consumed directly is very poisonous and can cause death. The fresh roots when touched directly can lead to blister. The raw corms that contains calcium oxalate can cause a burning sensation in the mouth, diarrhea, teary eyes, nausea and vomiting etc when consumed directly.